The Neshoba County Emergency Management Agency (NEMA) is a multi-functional agency whose primary duty is to prepare, respond and recover from several types of natural, man-made and technological disasters that may occur in Neshoba County. These disasters include severe weather emergencies such as large thunderstorms, tornadoes, floods, large fires and hazardous materials incidents. This agency serves as a data collection point for facilities in our county that manufacture and/or store hazardous materials. The location and type of these materials is important to know in case of a large fire or explosion. We also serve as a support agency for other county departments as well as assisting municipalities as needed. We are the liaison agency between the cities and county to the State of Mississippi and the Federal Government in case of a major disaster. On a daily basis, Neshoba County Emergency Management provides addresses to the unincorporated areas of the county in order to maintain a database for the 911 system. When someone dials 911, the 911 Emergency communications PSAP (public safety answering point) within our county receives the call with this address data on a screen to facilitate the dispatch of required assistance. With this information available, the dispatcher may still send help to a location even if the caller is unable to speak or the connection is lost. 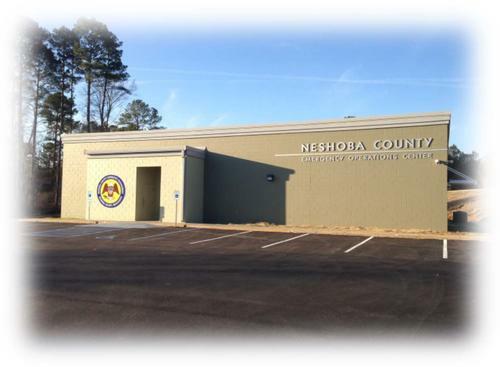 The Neshoba County 911 Communications was established in 1995 with the construction of the Neshoba County Law Enforcement Center at 920 Chestnut Street in Philadelphia. In May, 2014 the entire Emergency Management Department moved into the over 4,200 square foot Neshoba County Emergency Opeartions Center located at 911 Chestnut Street in Philadelphia.The center receives and handles all 911 calls for the City of Philadelphia and the unincorporated area of Neshoba County. This center is equipped with computer weather monitoring and warning systems that are designed to provide Neshoba County Citizens with prompt and accurate warning notifications. On behalf of the Neshoba County Board of Supervisors we would like to welcome you to the Neshoba County Emergency Operations Center. This facility will serve as the Primary Crisis Management Facility for the jurisdiction, will house the Public Safety Answering Point (PSAP) - which is the designated 9-1-1 Center & Warning Point for our jurisdiction as well as the Emergency Management Agency administrative offices. Construction of this facility has been made possible through an EOC Grant from the U.S. Department of Homeland Security’s Federal Emergency Management Agency which was awarded by the Mississippi Office of Homeland Security in the amount of $976,800. Additionally, construction of an internal saferoom within the facility and hardening of the walls, roofing system, windows and doors was made possible through a grant from FEMA’s Hazard Mitigation Grant Program (HMGP) as awarded by the Mississippi Emergency Management Agency in the amount of $233,267. Each of these grants required a 25% match which has been provided by the taxpayers of Neshoba County. The total budget for the project was $1,613,422 and upon conclusion we are $56,160 under budget for construction of the facility. From the dreamers who had original EOC construction plans developed in the mid 1970s for placement of an EOC below the Neshoba County Library when it was constructed in 1976 to the previous Civil Defense Directors, Emergency Management Directors, Fire Chiefs and other Public Safety Personnel who have yearned for an EOC - The dream of constructing a dedicated Emergency Operations Center for Neshoba County has been realized with dedication of this facility. The EOC is an approximately 4,200 square foot building consisting of three administrative offices, a conference room, a saferoom, the 911 center room, the EOC room, a break room, a server & communications room, a mechanical room, four bathrooms - including one with shower, a janitorial room and a small storage room. The saferoom and external walls of the building are 12” thick concrete block with rebar and poured concrete in each cell. The roof of the saferoom is made of precast concrete planks and is topped with concrete. The roof assembly of the whole building is metal truss with a metal roof deck that is topped with concrete, then has a water barrier and sacrificial roof on top of that. The windows are ballistic and have protection from a rolling storm shutter system. The saferoom and external doors are shelter rated and the building has an emergency generator. The new 9-1-1 center located in the EOC is Neshoba County’s third and most advanced PSAP. It features a four position Next Generation 9-1-1 System, Computer Assisted Dispatch (CAD) System, IP Radio Console and will operate various monitoring and warning systems. In addition to providing operations for Neshoba County this center will also provide 9-1-1 and dispatch operations for our friends and neighbors in Kemper County.